Microsoft Surface Pro 3, 4 and Book has a lot of improvements in term of battery life. However, if you are working on the processor and graphics intensive tasks, your battery will be drained so quickly and give you only 2 to 3 hours of battery life. 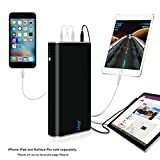 If you need to stay long in a classroom or a meeting and need to handle heavy tasks you will need to use an external power bank to charge your Surface while you’re working. Remember that, some power packs already included a Surface charging cable, so you don’t need to purchase it separately. Now it’s time check out our recommended power bank for charging your Surface devices. The Microsoft Surface Pro 4 with Intel Core M3 is the real fanless professional PC. This Surface model has some unique from all Surface Pro 3, Pro 4 and Book models including power supply specification. The Surface Pro 4 with Intel Core M3 is using a 15V voltage power supply for charging rather than a 12V voltage that is used in other models. So, you need to pay attention if you are using the Surface Pro 4 with Core M3. Now you need to make sure that the power bank output voltage will work with your Surface Pro 4 with Core M3. 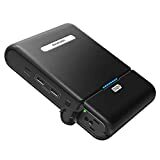 The compatible power bank needs to provide 15 volts output option. 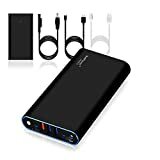 To get started, the BatPower has finally released its new version of its ProE portable power bank series after the original version ran out stock for a while ago. The BatPower ProE 2 is now even better with the new design for better portability. On top of that, the new version also upgrades its power adapter’s power up to 90W instead of 65W on the older one. 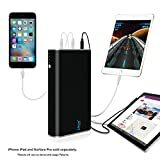 One outstanding feature that ProE carry on is the ability to use the included 90W power adapter to fast charge the power bank and Surface devices separately or simultaneously. As a result, on a single purchase, you will get both portable battery pack and a power adapter. Support 12V output for Surface Pro 3/4/Book. Support 15V output for Surface Pro 4 with Intel Core m3. Available in two capacity options 24,000 mAh and 35,000 mAh. Included a Surface charging cable. No external power adapter included. Lizone power bank is designed specifically to work great with Surface Pro3/Pro 4 and Surface Book. It does include a Surface Pro charging cable out of the box, so you don’t need to purchase it separately. Lizone has an exclusive Lizone QC technology that can detect your device to deliver the fastest possible charge speed up to 4A for the DC port and up to 3A per USB port. This power bank available in two capacity 24,000 mAh (88.8 Wh) and 35,000 mAh (129.5 Wh) that can charge your Surface Pro3/Pro4 approach 2.5 times and 4.5 times accordingly. Support Qualcomm Quick Charge 2.0. Battery capacity – 35,000 mAh. Included a 90W power supply. The Qi-infinity power bank features a large 35,000 mAh capacity and 12V and 15V DC output for Surface Pro 3, Pro 4, and Surface Book. The surface charging cable is already included in this product package. It also has multiple USB ports for charging your phones, tablets, and other accessories. On top of that, it also supports the Qualcomm Quick Charge 2.0 for fast charging all QC 2.0 compatible devices. In addition, this product also has a fast AC adapter that can be used to fast charge the battery pack. Moreover, the charger can also be used to charge your Surface devices as well with power up to 90W. Support 12V output for Surface Pro 3/4/(2017)/Book/Book 2/Laptop. Support 15V output for Surface Pro 4/(2017) with Intel Core m3. 3 x Fast IQ USB ports and 1 x Quick Charge port. Available in 24,000 mAh and 35,000 mAh. Included a fast charge power supply. Battery capacity – 23,000 mAh. Can’t charge Surface Pro 4 with Intel Core M3. Not included Surface charging cable. 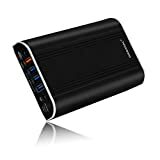 This RAVPower power bank features a high capacity of 23,000 mAh or approximately 85.1 Wh that can fully charge your Surface Pro model with 42 Wh up to 1 or 2 times. It has 3 ports, two of them are USB smart ports that can adapt the amount of current to your connected device, and another is a multi-voltage DC port that allows you switch to 9V/12V/16V/19V/20V to comply with your Surface and other laptops. This power bank also features a smart LCD screen accurately displays of power level, charging status and voltage selection. It uses a high-quality lithium-ion polymer battery cells that allow you to do at least 500 recharging cycles. It does not include the Surface charging cable, so you need to purchase it separately. Built-in LCD display for indicating battery percentage and other information. 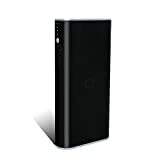 Available in 3 capacity options 10,000 mAh, 15600 mAh and 20,400 mAh. XTPower power bank gives you wide options of battery capacity range from 10,000 mAh to 20,400 mAh depend on your budget and your need. All those power banks are all supported 12V DC output, so you never go wrong with any option you choose for charging your Surface. Start from XT-16000 models, they have an LCD display for indicating power level, charging status and voltage selection. Included 14 kinds of connectors. This MAXOAK power bank features a very high capacity of 50,000 mAh or approximately 185 Wh that can fully charge your Surface Pro model with 42 Wh up to 4.5 times. It has two 2.1A USB ports, two 1A USB ports, one 12V 2.5A DC port, and one 20V 3A DC port. With 12V 2.5A DC port, it provides enough voltage and current for charging your Surface Pro 3/4/Book properly but not for Surface Pro 4 with Core M3 as it doesn’t have 15V output option for charging them. It uses a high-quality lithium-ion polymer battery cells that allow you to do at least 1000 recharging cycles with built-in 6 security protection. It does not include the Surface charging cable, so you need to purchase it separately. Note The amount number of effective power bank battery capacity might be reduced upon energy loss through heat, cable, and the electrical circuit. 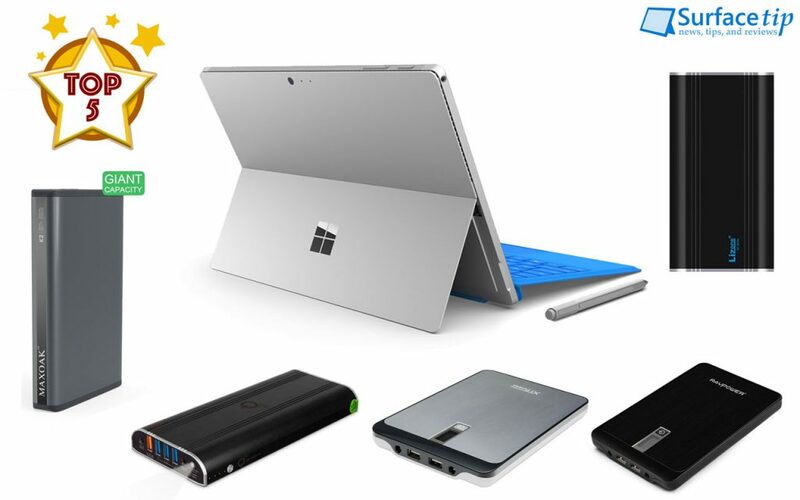 We appreciate hearing your thoughts, questions, and ideas about “The Best Power Banks for Surface Pro, Book, and Laptop in 2019”. Please post respectful comments and on topic. We will be replying back to you as soon as possible. 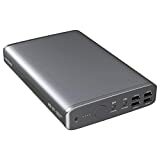 Share your idea about "The Best Power Banks for Surface Pro, Book, and Laptop in 2019".